Every American generation has looked for advice. Today it’s in our pockets on a phone. It used to be in magazines and books. (How many of you or your parents used Dr. Spock’s Baby and Child Care book?) The reason for seeking advice remains the same: should I call someone or can I take care of this problem myself? Last month my “new” find in the archives vault was the Church Home Hospital ledger. 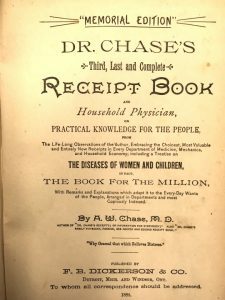 This month I found Dr. Chase’s Third, Last and Complete Receipt Book and Household Physician, printed in 1888. 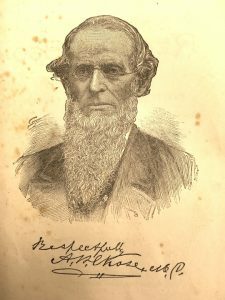 Dr. Alvin Wood Chase (1817 – 1885) was born nearby in Cayuga County. The publisher’s “In Memoriam” leaves out large parts of the doctor’s life. He didn’t study medicine until almost the age of 40, graduating from the Eclectic Institute of Cincinnati. (Geneva physician Dr. Ethelbert Padgham graduated from the Eclectic Medical College, the successor school.) Eclectic referred to the practice of choosing whatever would help the patient – botanicals, physical therapy, or drugs. Eclectic describes Dr. Chase’s books. 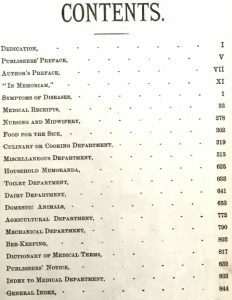 His first was, Dr. Chase’s Recipes Or Information For Everybody (1866) and the second was Dr. Chase’s Family Physician, Farrier, Bee Keeper and Second Recipe Book (1873). The contents of his final book covered everything from midwifery to mechanics. Names of diseases and remedies are unfamiliar to modern readers. St. Vitus’ Dance is Sydenham’s chorea, a reaction to childhood infection. Black cohosh is the flower Actaea racemose, used for centuries to treat nervous disorders and cramps. Bromide of potassium was prescribed as an anti-convulsant and sedative in the late 1800s and early 1900s. People have used varieties of caustic chemicals to remove warts, moles, and freckles. The advice to use nitrate of mercury wasn’t unusual at the time. Mercury, arsenic, cyanide, and other toxic chemicals were common remedies used by doctors and sold as patent medicines. If you find old medicine bottles with pills, powder, or liquid it’s safest to treat them as hazardous materials. Much of Dr. Chase’s advice was copied from other people’s writings or from letters sent to him. Has anyone heard of the “orange cure”? 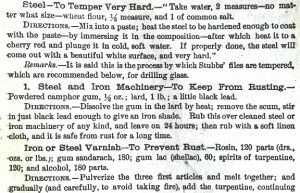 The Mechanical Department had recipes for preventing rust and making things work better. As you ask Alexa, Siri, or another voice-activated Internet device to get information for you, think how your grandparents (or greats or great-greats) got their answers. If you’d like to see more for yourself, the 1873 edition of Dr. Chase’s book is available online. Other curator “finds” The Church Home ledger and Geneva’s Gallant Sons. Thank you for posting a link to the 1873 edition of Dr. Chase’s book. Very interesting! I had never heard of the doctor before, but recently came into possession of his Third, Last, and Complete book, which is very crispy and fragile ( but came complete with some pressed flowers from who knows when!). I’m glad I discovered your site when I googled Dr Chase’s name. Thank you!